Standards: The MSR255 complies with EU-Directives RoHS / WEEE. 2. Select the measurement parameters for the sensors (internal and external). 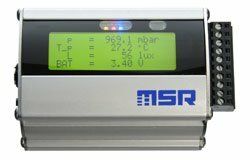 You can specify your MSR255 with up to five different sensors. Please select your desired measurement parameters here. 3. Do you require external sensors instead of internal ones? 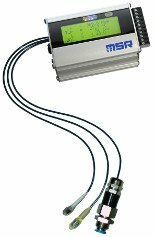 Instead of the internal temperature, humidity, air pressure, 3-axis-acceleration and light sensors you may optionally select the corresponding external sensors (not pluggable) for the MSR255 datalogger. 4. Do you require an additional 4 analogue inputs for connecting third-party sensors? It is possible to expand the range of possible applications for which your MSR255 can be used by specifying four analogue inputs. These additional inputs allow external sensors for a wide range of measuring tasks to be connected. If required, these third-party sensors can be powered by the logger's internal battery. The power can be automatically turned on before measurements take place with a pre-settable lead time. This allows any necessary warm-up periods for the sensors to be taken into consideration. starting and stopping data recording.